Hi, my name is Janice Kaat. I read the article in the advertiser in Seymour where I live. It was a great article about Firefly Acres Horse Farm and I was anxious to learn more about it. The first time I came nobody was at home but I had a chance to meet all nine horses. I had a feeling I knew which horse I had connected with right from the start but I wasn’t sure of their names. The second time I was able to meet with Lisa and get introduced to them all. Tina was the one that I had picked out the first time and it was Tina who I chose to work with. Before coming to Firefly Acres I had never worked with horses before. I loved them, and had rode some, but had no training whatsoever. Due to some medical issues I could not continue with work, schooling, or driving. I lost what confidence I had acquired through my time in college and I had physical challenges as well. Since my son passed away 6 years ago I really had no sense of beauty or joy. I suffered from depression and a lack of enthusiasm for anything. I had trouble with balance, focusing, and recall. I checked into transportation and got a ride on Tuesdays and Thursdays so I could help out with the horses or anything else they needed done. After my second session I had a appointment with my therapist and she said, “You don’t need to see me anymore. Working with the horses has helped you more than I ever could. You just keep doing what you are doing.” The following Tuesday I got dropped off early and I was sitting on the porch watching the horses. It dawned on me how quiet and peaceful it was out here. A week later I again was sitting on the front porch watching the horses. Some of them were rolling in the mud, some were trotting around. An owl was sitting on a fence post watching me. I realized how beautiful it was. Except for a horse letting go of her adrenaline everything was quiet. I also realized that for the first time in six years, since I lost my son, I could see the beauty around me. I was so overjoyed it brought me to tears. What a blessing God had given me. What a blessing Firefly Acres has been for me and others. Working with the horses has helped me gain back my confidence, given me peace inside that I didn’t think possible, and helped me to cut down on my medication and stop one completely. It has calmed me down and has helped me to think on the spot, because when you are working with horses you have to be ready for anything. Also if you are calm the horses are calm too. I have helped them, but they have helped me more than I even thought possible. 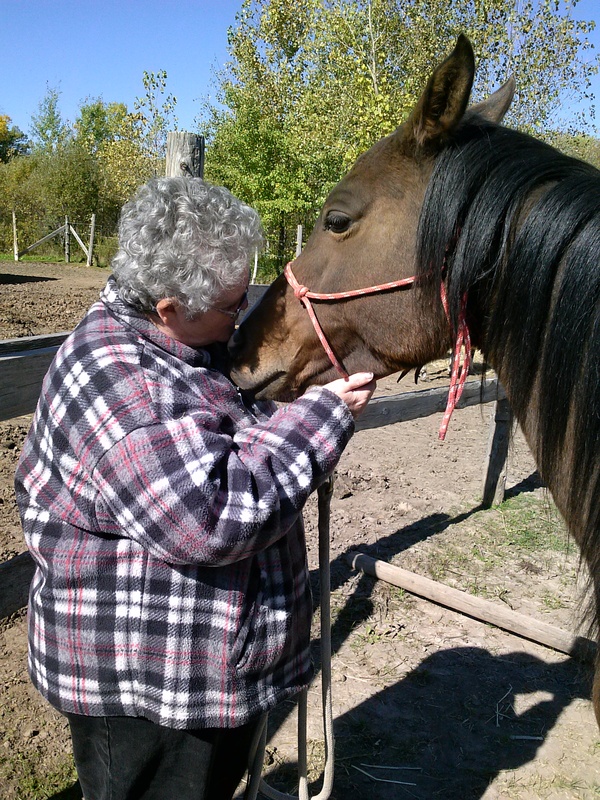 It gives me great pleasure to see the positive reaction and love I get from the horses, especially my horse, Tina. Lisa is a great trainer and is easy to work with. She knows my limitations and is right there by me while I’m learning the ropes. I’ve got a lot to learn, but I don’t see myself going anywhere else. She is patient and has a way of getting more out of you than you thought you were able to do. I would recommend this place to anyone who loves to train horses, ride horses, groom horses, or simply sit and watch them. As I was typing this I was watching the males run up and around the pasture. Who wouldn’t smile watching that? When I first met Tina she jerked away from me when I would try to hug her or kiss her. I learned later that they have to respect you first before they will allow you to do that. As you can see in the above picture, I have gained her respect and trust. I’ve learned to put her halter on, groom her, and train her in the Parelli Level One ground exercises. It is great to see the progress she has made since I started working with her. I can see that she has gained confidence and is doing real well with things that are new to her. I am very proud of her and very happy to be part of the Firefly Acres Horse Farm. Firefly Acres is the place to be. It’s a place of healing and love for animals, particularly horses. I went to Firefly Acres because of my love for horses. Little did I know that I myself would go through a healing process. I went through some major depression and for about 2 weeks I went out to the farm not knowing that I would make friends with the horses. Lisa Pelky is an amazing person. She played a big part in my healing process. She made me feel that I was worth something and she trusted me to work with her horses. I never had someone trust me like that. So whoever wants to be healed in an amazing way please, please come out to Firefly Acres! You will be welcomed warmly. Lisa would love to have you, so would the horses.